FOR MORE GREAT SMARTPHONE DEALS, CLICK HERE! These are all the qualities a modern flagship needs, but there are a few tricks up the S3’s sleeve that might just give it a leg up on the rest of the Android crowd. The one feature we liked most was Pop-up Play, which shrinks the video you’re playing into a moveable rectangle, allowing you to continue surfing the web or texting while watching a movie. It works a treat and it’s something we definitely want to see on Samsung’s tablet range too, although if they can manage to pause the video without taking you back to the video player it will be even better. Samsung also touts Smart Stay, which tracks your eyes to see if you are still reading and accordingly does not turn the screen off. It works well, but only if you’re not wearing glasses. S Voice speech recognition software also makes an appearance, but just like Apple’s Siri, it’s a bit of a hit and miss affair, and in certain cases it’s simply easier to do things manually. We stopped using it after a few try-agains on the speech recognition front. Samsung's S3 is a lot bigger and sleeker than the Galaxy S2 but does not feel cumbersome at all. It is only 1 mm thicker, with a difference of 16 g on weight – not a lot. The device looks a lot smarter than the boxy S2, but Samsung unfortunately still sticks with plastics, and although build quality is good, we can’t help but wonder what difference a bit of real metal would do. Unlike Sony with its Xperia S, Samsung provided Android Ice Cream Sandwich out the box. On top of this you’ll find the company’s TouchWiz user interface, version 4.0, which is less annoying than the previous iterations but still not as suave as HTC’s Sense skin. Regarding controls the Galaxy S range is certainly the best out there. The S3 makes use of the familiar home (physical), menu, back and buttons, while long pressing the home button brings forth the recently opened apps screen. Here you’ll find the apps stacked in a vertical column on the side, allowing for easy selection and scrolling, while a flick to the left closes the app. Luckily there was very little that left us annoyed with TouchWiz version 4, and we did not head to the Google Play Store to find the nearest application launcher as we did in the past. Having said that Samsung must improve the method used to seed apps and widgets on your different screens – it’s cumbersome and very inefficient. 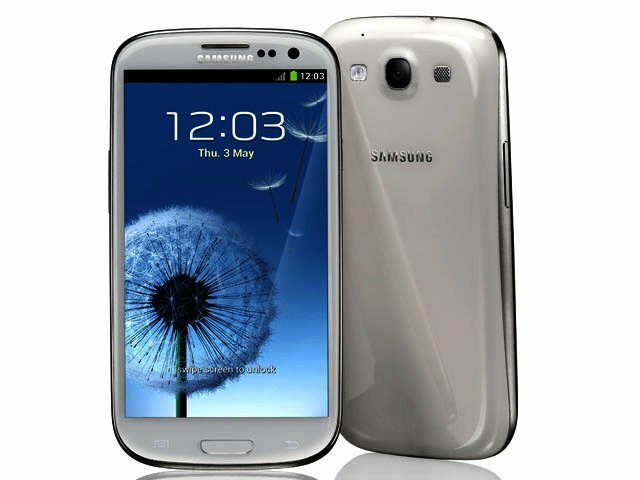 The Galaxy S3 is much sleeker than its predecessor, available in white and blue. As can be expected the 4.8" Super AMOLED screen is of course delightful, and although pixel count is not up there with the best of them (306 ppi vs the Sony Xperia S’s excellent 342 ppi and the iPhone 4S's 330 ppi), images and webpages are extremely detailed and crisp. Put the S3 on full brightness and you won’t have a second’s trouble viewing it in full daylight, but we did find that automatic brightness indoors displayed slightly darker than we would have liked. One of the tech duals we looked forward to was matching-up the Samsung’s 1.4 GHz Exynos 4212 Quad with its closest competitor, the mighty Tegra 3 1.5 GHz chipset as found on the HTC’s One X. Interestingly, the results were split, with the Galaxy S3 obliterating the opposition on the Antutu benchmark (11887 vs. the One X’s 10652 and the Xperia S’s 6658), but coming in second on SmartBench 2012 (Gaming Index: 1606, Productivity Index 4064 vs. One X’s 2713 and 4792 respectively). Using the Valemo benchmark the S3 once again came out tops, providing 2089 against the One X’s 1550. Keep in mind that these two phones can be found straight at the top of a range of devices we've tested thus far. Benchmarks are of course not the be all and end all of device performance, and if we were pressed on general performance (starting the camera, returning to the home screen from the apps menu, opening key functionality) we would actually go with the One X, although browsing was a lot sleeker on the S3. Measured against the recently tested Sony Xperia S and HTC One X, the S3’s eight megapixel camera has a bit of catching up to do. It’s simply not as fast to start or capture, while both the other two have burst modes and best shot selection accessible straight from the shooting screen, and not only as a menu option as the S3. The S3’s autofocus though is fast and is also conveniently available while shooting movies (1080p). There’s no physical shutter button, so once you’ve composed or focussed a shot, it’s not that easy to push to the onscreen shutter button, without spoiling your shot. It’s also difficult to turn off the shutter noise since you actually need to put the phone to vibrate or mute to do so – very annoying. Video is great with the autofocus helping a lot, while playback on the device looks stunning. Kudos must go to the fact that all your video icons are “live” when viewing them in your video folder – this is an excellent feature which makes selecting which movie you want to watch a lot easier. You can also capture pictures straight from video, but only while recording, not from playback. Unfortunately there is no micro HDMI cable to connect to a HDTV, but Samsung does include DLNA connectivity. One final point of importance is the S3’s increased battery size, now with a 2100 mAh Li-Ion one compared to the HTC One X's 1800 mAh. Although this won’t stop you from having to recharge before going to bed, it does provide a few extra hours to bargain on before you need to plug it in. Battery usage is also very dependent on how often and for what you'll be using the phone - some days we were recharging during working hours already, other times it kept going through the night. The fact that the battery is removable is another one-up on the One X, since there is no need to send it for repair once you need a new battery. Next to the battery is a hot-swappable microSD card slot, allowing you to rather cheaply upgrade the phone’s storage in future when apps and video have overburdened the device. Via S-beam you can simply bump two S3 together to share content - easy, but it only works with other S3 devices. As could have been expected, the Samsung Galaxy S3 has flagship written all over it and is one of the top two devices currently available (the HTC One X being the other). But it's extras such as Pop-up Play and Smart Stay that shows that Samsung is trying to push innovation, not being content with only offering the same features found on competing Android devices. As the leading manufacturer of Android devices, we expect nothing less. It retails from Nashua Mobile for R7740 for the 32 GB version and R7000 for the 16 GB one. Pros: A number of added extras such as Pop-up Play and moving video icons; bigger battery; sleeker looks than S2; great 4.8" screen. Cons: Still no metal used in design; app seeding on home-screens cumbersome; some functionality difficult to find.